Consider a vector field , and a loop which lies in one plane. The integral of around this loop is written , where is a line element of the loop. If is a conservative field then and for all loops. In general, for a non-conservative field, . for the orientation giving . Here, is the area of the loop. 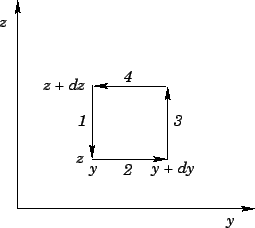 The direction of is perpendicular to the plane of the loop, when it is in the orientation giving , with the sense given by the right-hand grip rule. where is the area of the loop. 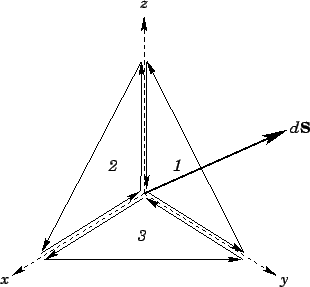 This demonstrates that is a good vector field, since it is the cross product of the operator (a good vector operator) and the vector field . The first part has the same curl as the velocity field on the axis, and the second part has zero curl, since it is constant. Thus, everywhere in the body. This allows us to form a physical picture of . If we imagine as the velocity field of some fluid, then at any given point is equal to twice the local angular rotation velocity: i.e., 2 . Hence, a vector field with everywhere is said to be irrotational. for some (non-planar) surface bounded by a rim . This theorem can easily be proved by splitting the loop up into many small rectangular loops, and forming the integral around all of the resultant loops. All of the contributions from the interior loops cancel, leaving just the contribution from the outer rim. Making use of Eq. (151) for each of the small loops, we can see that the contribution from all of the loops is also equal to the integral of across the whole surface. This proves the theorem. So, is a solenoidal field. Thus, a conservative field is also an irrotational one. It should be emphasized, however, that the above result is only valid in Cartesian coordinates.